San Diego, which spent a good chunk of the season ranked fifth in the nation, opens its championship bid Friday against Baylor. The University of San Diego is quiet, almost still. The water of nearby Mission Bay is clear, and the breeze is comforting -- not too hot, not too cold. Bikers pedal leisurely toward downtown, just a few miles away. But inside Jenny Craig Pavilion, less than three minutes into volleyball practice on a recent afternoon, players are shouting and sprinting, smashing balls and smacking hands. Each swing is a statement, each leap a challenge. Hustle is as intrinsic to the Toreros as the relentless traffic is on nearby I-5. Each drill is a competition, from stretching -- who can be the most flexible? -- to "Plus 5" -- who can score five consecutive points against a double block? Hitting errors result in a loss of a point; keeping the ball in play results in a wash.
"People are upset, yelling, really, really getting into it," said former USD star Alaysia Brown. "Whoever beats you won't let you forget." That's because San Diego, a school of less than 6,000 undergraduates competing against BCS schools more than triple its size, has national championship dreams. 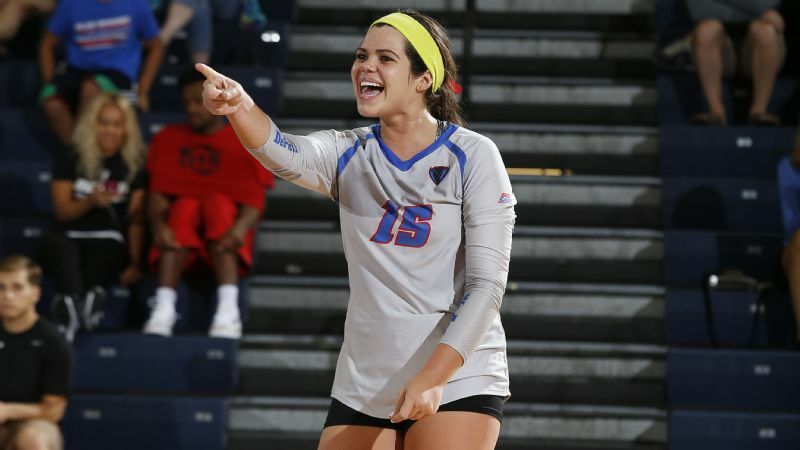 The volleyball program will make its 20th NCAA tournament appearance this week. And after two unexpected losses to unranked Portland and Pepperdine earlier this month, San Diego (24-5) is aiming for a breakthrough. The unseeded Toreros, who climbed as high as No. 5 this season, face Baylor (21-11) in the first round Friday. This season's motto is emblazoned on the locker room's whiteboard: CHAMPION OR CHUMP. THE CHOICE IS YOURS. "It's in our hands," junior setter Kristen Gengenbacher said. "We have the ability to go out there and take it and fight for it." 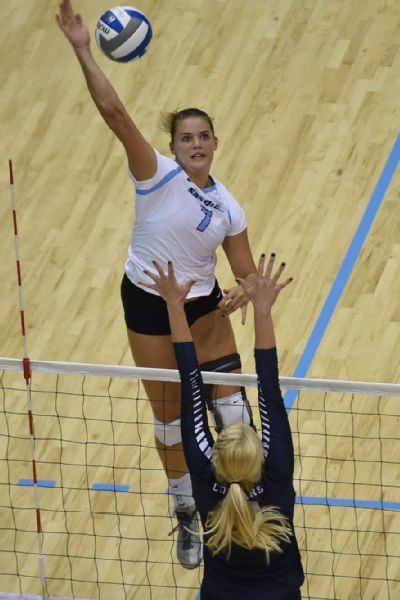 Senior Lisa Kramer is averaging 4.21 kills per set for San Diego. San Diego shocked everyone. Down 0-2 to No. 11 Stanford on the road in August, USD rallied behind sophomore Lauren Fuller's career-high 20 kills to win in five. It was USD's first win over Stanford, which suffered its first season-opening loss since '08. 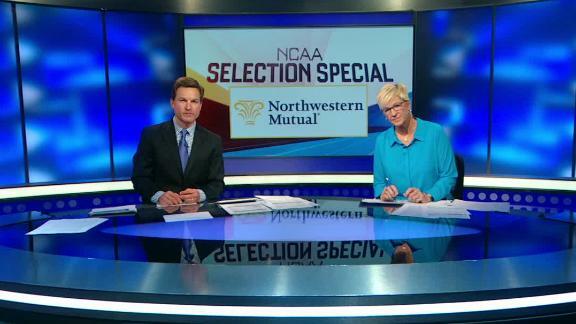 "That set the tone for this season," senior All-American Lisa Kramer said. "We're willing to fight. We're willing to come back. We're not going to give up." USD also upset UCLA and swept BYU and Colorado, relying on depth in veterans like Kramer, Gengenbacher, libero Hunter Jennings, middles Lauren Schad and Kaity Edwards and opposite Jayden Kennedy. Underclassmen also played key roles, including Fuller, outside hitter Thana Fayad, setter Anna Newsome and middle Addie Picha. Coach Jennifer Petrie, in her 18th season, pieced together a challenging schedule that included early losses to Big Ten powers Minnesota (a 3-1 defeat) and Wisconsin (3-0). "We took on this persona that 'we'll play anybody anytime.' We're happy to challenge ourselves," said Petrie, who guided her team to an 18-match win streak thereafter, one shy of the program record. "When you start to believe that this is where you belong," Petrie said, "it creates a culture that the girls believe that they can compete." Coach Jennifer Petrie and the 24-5 Toreros didn't shy away from anyone in 2016. No one believed in San Diego's potential more than Sue Snyder. It was 1989. The new volleyball coach inherited a team that had finished 2-26, offering roughly four scholarships per season. The previous coach, John Martin, started the program in 1975 and had a budget of just $1,000. In 1976, he had a team of seven players -- including two subs who had never played volleyball before. Martin also drove the vans to road games and served as director of facilities and operations. "You found yourself kind of scrambling once in a while to meet your obligations, but that was USD at the time," Martin said. "They were kind of figuring out themselves athletically." Snyder sought to change that. "The expectations were that this is a Division I program and we're going to play like it," Snyder said. "We trained really, really hard. We wanted them to feel like winners." 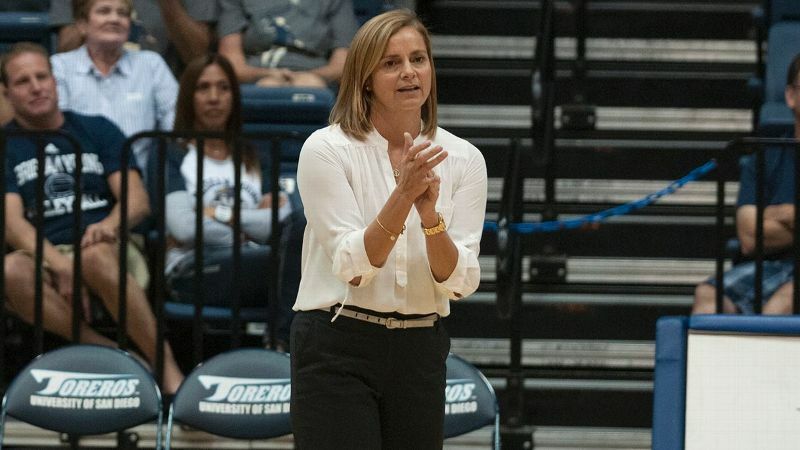 Gaining more scholarships each season, Snyder led the Toreros to the NCAA tournament four times in her nine-year tenure. Petrie, Snyder's top assistant for two years, took over the program in '99. "I remember thinking to myself, 'OK, don't tear down the empire,' " said Petrie, who has led USD to 13 NCAA appearances, including two Sweet 16 berths (2004 and 2013) and six West Coast Conference titles. It has nothing to do with the size of your school. We just want to be the best. Players find not just a coach, but a maternal figure in Petrie. "We'd go in her office not even knowing we had a problem, to figure out we had a problem and she would help us through it," former standout Katie Hoekman said. "That was the greatest thing about her: She listens to you." In 2013, the Toreros received their highest-ever national ranking as a Division I school, No. 2, downing No. 1 USC and later advancing to the Sweet 16. "We always thought we were good. 'Yeah, we're top 25. We're going to win our conference and then we'll go play USC in the first round and lose.' That was our M.O. for a few years," Hoekman said. "But then we beat USC, we beat UCLA, and finally, we were frustrated with being the team that loses in the first or second round." Though San Diego is still often underestimated, it doesn't describe itself as a "mid-major" or "small school." "We just think of ourselves in terms of, 'Where do we want to be? Who do we want to be?' " Petrie said. "It has nothing to do with the size of your school. We just want to be the best." Brent Hilliard, longtime associate head coach and interim head coach in 2006 and 2010, noticed a change in expectations. The goal now exceeds simply making the tournament. "Once you gain that consistency, I don't think you search for it anymore. You just try to improve on it," Hilliard said. "We're just trying to compete for the ultimate prize. We're looking for that breakout season." 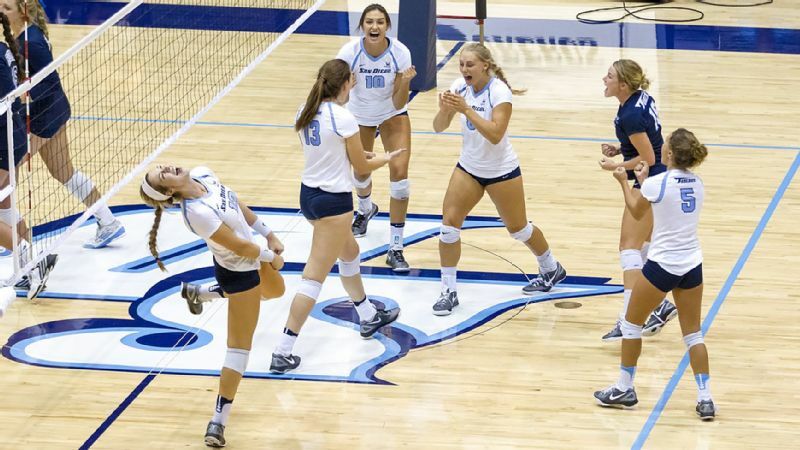 From early September to late October, the Toreros didn't lose a match; most were sweeps. 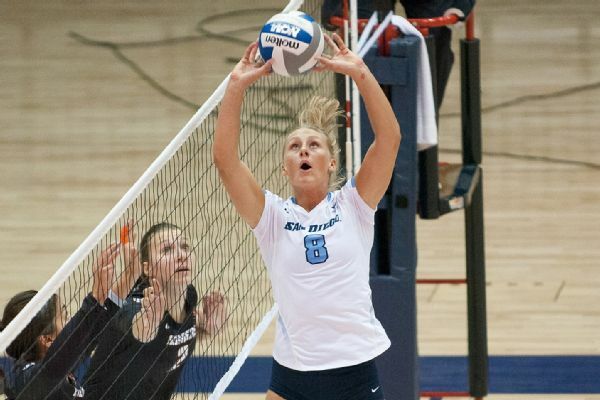 Then, WCC rival BYU spoiled the streak, handing San Diego a 3-0 loss. Setter Kristen Gengenbacher and San Diego were unranked in the preseason poll and didn't even wait one game to make a splash. Players were heartbroken. Then they were silent. Then they were angry. Then they were scorned. The feeling of being wronged, of resolving to make right, permeated the next practice. If someone wasn't going for a ball, the response wasn't: Come on, let's get these balls. Names were called out. "We were on each other," Jennings said. "The coaches didn't even need to yell at us." After a disappointing close to the regular season, San Diego heads to the NCAA tournament in a familiar place: with something to prove. CHAMPION OR CHUMP. THE CHOICE IS YOURS. "There's a lot of teams we beat this season that were firsts for us," Petrie said. "Every time you have that, it kind of gives them a little feather in their hat, that we are somebody that you need to contend with."